The definition of networking: A socioeconomic business activity in which businesspeople and entrepreneurs meet to form business relationships to recognize, create, act upon business opportunities, share information, and seek potential partners for ventures. Well that is a mouthful, isn’t it? Before the advent of the internet, Facebook, LinkedIn, Twitter, Instagram, and every other social media platform, networking was a little more difficult. Word of mouth and who you knew were key components to finding new clients and markets. 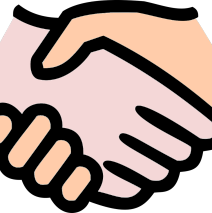 Conventions and trade shows were the standard means of networking. These types of events still play a major role in business networking, but now electronic networking holds a much larger piece of the pie, in my opinion. Each and every day I network with my clients, potential clients, and peers, but I still make time for in-person opportunities. To that end, this week I’ll be flying to Atlanta for a conference myself. I’ll be presenting on business biographies to a group of (amazing) handmade sellers. We will be networking. We will swap business cards, make friends, and talk shop. It will be fun, and it will be a lot of work for the presenters and organizers. Have you been to any conferences or trade shows within the last year? Did you find them to be beneficial or not so much? If you have a particular favorite, please share the information below in the comments so we can continue to network electronically while searching for those in-person opportunities. Thank you very much. I hope you continue to enjoy my articles. Thank you for your kind words. If you ever have topic requests, please feel free to send me a message or comment. I wish I kknew of any conferemces or trade shows for Silhouette, cinyl work, Etsy shops, etc. I could benefit from it all! Have fun! Thank you! I’m excited to live tweet the event.